Objective: This experimental study was designed to measure discrimination thresholds for haptic perception of size in manual operation. Methods: Common manual operation modes with finger pressing or pulling, three finger pinch or grip, and hand grip were used in this study. Taking the index finger pressing operation as an example, the distal phalanx finger length and the width of the index finger were measured in order to determine the size range of sample buttons. The assessment procedure along with the measurement data sheet of index finger regarding pressing operation was designed. Study subjects were recruited and discrimination thresholds for the size haptic perception of the index finger were measured and analyzed. Results: The press operation assessment of index finger was performed on one-hundred subjects. By statistical analysis of valid data, the index finger size discrimination threshold of 1–2.5 mm was obtained. The discrimination threshold (2–2.5 mm) of male subjects was somewhat greater than that (1.5–2 mm) of female subjects. The size discrimination threshold in the elderly population was slightly larger than the young group. 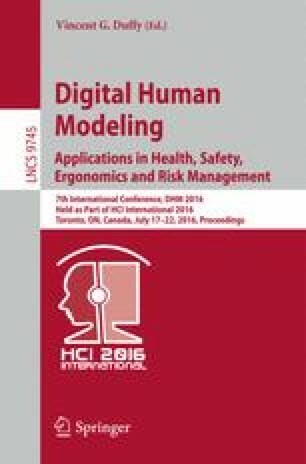 Conclusion: The study results can provide basic data for the selection of sample size step of manual devices, thereby serving as the cornerstone of the effectiveness and accuracy in ergonomic design and assessment. This research was supported by the National Key Technology R&D Program (2014BAK01B02, 2014BAK01B04, and 2014BAK01B05), 2015 Beijing Municipal Education Commission Research Project (12213991508101/008).